Hi, I’m Woodie. 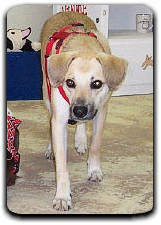 I began my life as a sickly pup and was under the care of the veterinarian at Carolina Beach. The Pet Hospital put my picture in the local newspaper hoping to find a family to adopt me. My family saw the picture and came immediately to the hospital to see me. I took time out from keeping all the other dogs at the vet in their place, to meet my new family. My family took me home to meet my big brother, Tippy. From the beginning we sniffed, barked and chased each other, and became best buddies. Tippy passed away a while ago, and I miss him. He showed me the ways of a dog's life and I am curious enough to look for more. I like everyone immediately and am ready to play! My birthday is December 5th.